The New York Giants have placed defensive lineman Kristjan Sokoli on season-ending Injured Reserve. Sokoli tore an ACL in one of his knees in Thursday’s preseason game against the Cleveland Browns. To fill that roster spot, the Giants also re-signed rookie free agent cornerback Mike Jones (Temple University), who had been on the roster for a few weeks in May and June. The Giants Sokoli signed to the Practice Squad in late December 2017. Sokoli was originally drafted in the 6th round of the 2015 NFL Draft by the Seattle Seahawks. The 6’5”, 300-pound Sokoli has spent time with the Seahawks (2015), Indianapolis Colts (2016), and New Orleans Saints (2017). The Albanian-born player has played both on the offensive and defensive lines. Not practicing on Sunday due to injury were wide receiver Travis Rudolph (quad), tight end Ryan O’Malley (ankle), defensive end R.J. McIntosh (unknown – Active/Non-Football Illness list), linebacker Connor Barwin (“soreness”), linebacker Thurston Armbrister (hamstring), cornerback Donte Deayon (hamstring), and safety Darian Thompson (hamstring). Curtis Riley started at free safety and William Gay was the first-team slot corner. Quarterback Eli Manning hit wide receiver Cody Latimer deep against cornerback Leonard Johnson. Latimer later beat cornerback William Gay across the middle. 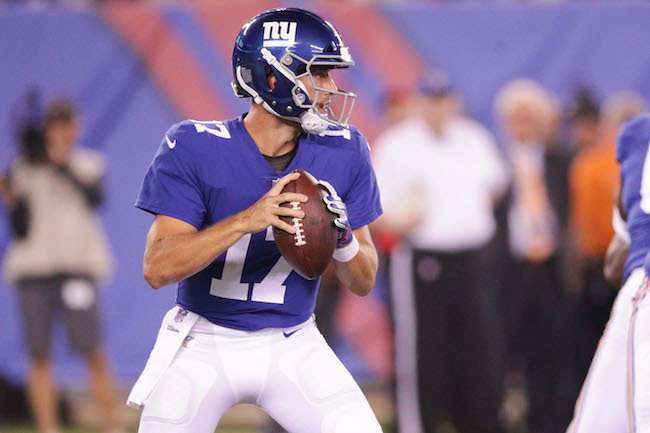 Quarterback Kyle Lauletta received some second-team reps and quarterback Davis Webb received some first-team reps.
Quarterback Eli Manning tossed a shovel pass to tight end Evan Engram in the red zone. Quarterback Eli Manning threw a fade touchdown pass to wide receiver Cody Latimer over cornerback Janoris Jenkins. Center Jon Halapio picked up a blitzing linebacker Alec Ogletree on the play. Quarterback Davis Webb hit running back Wayne Gallman for a touchdown. Quarterback Davis Webb made an excellent throw to wide receiver Sterling Shepard as he broke deep down the sideline. Defensive end Kerry Wynn intercepted a quarterback Davis Webb screen pass and returned it 80 yards for a touchdown. Wide receiver Kalif Raymond beat cornerback Grant Haley deep down the field, but quarterback Kyle Lauletta overthrew him. Wide receiver Alonzo Russell made two long completions, including leaping over cornerback Grant Haley to make a tremendous catch. Cornerback B.W. Webb knocked away a couple of passes. The players will practice on Monday (no public access) before traveling to Michigan to practice against the Detroit Lions on Tuesday, Wednesday, and Thursday (open to public).